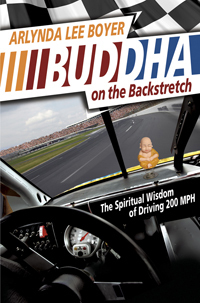 By using Buddhism as a lens to examine NASCAR racing—and NASCAR as a means to illustrate Buddhist teachings, Buddha on the Backstretch provides a unique new perspective to the field of sports and spirituality. Not aimed solely at either Buddhists or race fans, the work’s message of self-improvement via popular culture serves as a Zen and the Art of Motorcycle Maintenance for a new generation. Buddha on the Backstretch considers mindfulness, handling setbacks, patience, discipline, heightened awareness, impermanence, equanimity, and how we face death. The work looks at why we need heroes, and how we can take a hero’s story and use it for our own growth. Like an anthropologist, the author can take a story about loose radiator bolts and red North Carolina clay and tease out of it three different Buddhist elements of mindfulness. The aim is to show readers how to examine all facets of culture and all the people around them, and be able to find, in the seemingly most unlikely places, profound lessons on how to live. If the student is truly ready, then a NASCAR driver can be as profound a teacher as a guru in robes, and a serene Buddhist teaching as lively and colorful as a weekend at the track. The first work by an imaginative and quirky new author, Buddha on the Backstretch will alter the way you see the world, help you see wisdom everywhere and find the joy in the daily spiritual practice that is life.